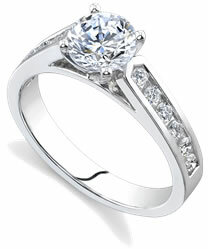 View our diamond rings here. If you are in the market to purchase a diamond, you'll be learning all about the 4 C's of diamonds: cut, color, clarity and carat. But in the mind of the average buyer, there is a fifth “C” that just may be the most important of all them: the diamond cost. The actual price of a diamond is determined by a grading system that takes into account the cut of the diamond, the color, the clarity and the number of carats. There is a non profit organization called the Gemological Institute of America (GIA) that has devised the official grading system of diamonds, and because of that system, a diamond that is of more carats may cost less than a smaller diamond if the larger diamond has inferior cut, clarity or color ratings. Diamond cost is also determined by the retailer. The Internet provides a wealth of information on diamonds, educating buyers on the value of diamonds based on size, shape and clarity - and luckily, diamond cost is regulated by industry guidelines. This means you can shop for your diamond gem stones online with as much confidence as you would shopping for jewelry at your local retailer, especially if you take the time to become knowledgeable about diamond cost before beginning your search for the perfect stone. Every jeweler sets their own prices on their gemstones, rings, necklaces and other items. When dealing with diamond cost, it also depends on the shape of the diamond. A ”round brilliant” shape will tend to cost more than an ”emerald” shape even when they are the same quality and the same size. If you have a minimal budget, such as $500 or less, you can expect to find a diamond with a carat weight between .15 and .25, set in 10-14k gold. If you're in the market for a diamond cost of $500 to $750, you can expect to be able to purchase one between .20 and .37 carats. If you are looking for a 1 carat diamond, you should expect your diamond cost to range between $2000 and $3500. When you are researching diamond cost, there are many more factors to consider than just the size of the diamond. Remember that the shape (cut) of the diamond will greatly affect the diamond cost, as well as the clarity of the diamond. You can get multiple, smaller diamonds for less cost than you can a single, larger diamond due to the rarity of mining a larger sized diamond. Sometimes a diamond will be beautiful to the naked eye, and have a reasonable diamond cost- but it may have a lower rating for quality or tone given by the GIA. When you are shopping for your diamond, you'll need to decide what is more important to you; the diamond cost, the size of the diamond, the quality (the rating as given by the GIA), or how it looks when it's worn.